Best Stuffing Ever! | Eat More Plants. But then when I get that first bite of the heart, I know why. Every once in a while I get the urge for stuffed artichokes. They’re a holiday food in my mind, something my dad and/or my brother make every year for Thanksgiving and Easter too. Granted its a lot of waste and a lot of arm strength, they really are a nice treat. My Nana always stuffed them with breadcrumbs, parsley, olive oil, Parmesan and pignoli nuts. I’m going a different route here, more veggies and no cheese. 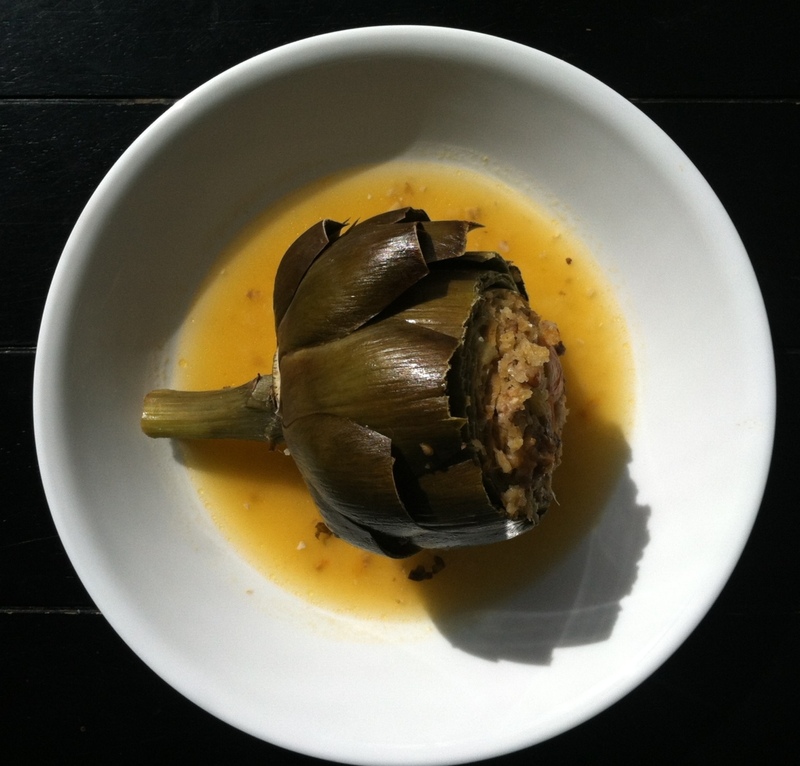 I only stuffed two artichokes so I had about a cup of stuffing leftover. I used it to stuff a zucchini! Equally delicious. Mix the tomatoes, garlic, breadcrumbs, mint, parsley, mushrooms, walnuts and oil. Add salt and pepper, taste and add more if needed. Squeeze in the juice of half a lemon and mix thoroughly. Cut the stems down to the base if the artichoke or peel them down a bit if you want to leave them on. I leave them on for aesthetic purposes mainly, cut them off if you want them to sit upright in the pan. This helps if you want to make a lot at a time. For only two chokes, it doesn’t make a difference. Peel off a few layers of leaves until they don’t feel terribly tough anymore. Cut the tips off of any remaining leaves if they feel sharp. And yes, you will be peeling off a lot of leaves to get to the “good” part. Throw the waste in your compost! Cut the top third of the artichoke off. Use a sharp knife for this, it’s pretty tough. Scoop out the purple inside as well as the “choke”, which are the hairs underneath the purple leaves. Easiest to scoop the middle out using a small spoon or a melon baller. A measuring tablespoon works well too! For eggplants or squash, just slice them in half lengthwise and scrape out the seeds with a spoon to make enough room for the stuffing. If they don’t sit flat, slice off a bit of the underside to create a flat surface. For zucchini, tomatoes or eggplant: bake for 25 minutes and brush surface lightly with olive oil to prevent burning. 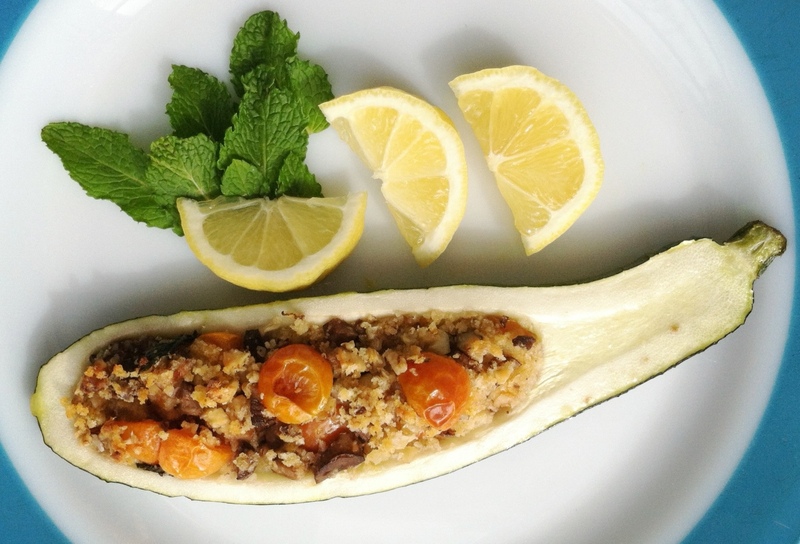 You want the zucchini to get softened but still hold its shape. Eggplant should take the same amount of time. Tomatoes will take a bit less time, about 15-20 minutes depending on their size. Tomatoes get soft quick! Keep an eye on them. 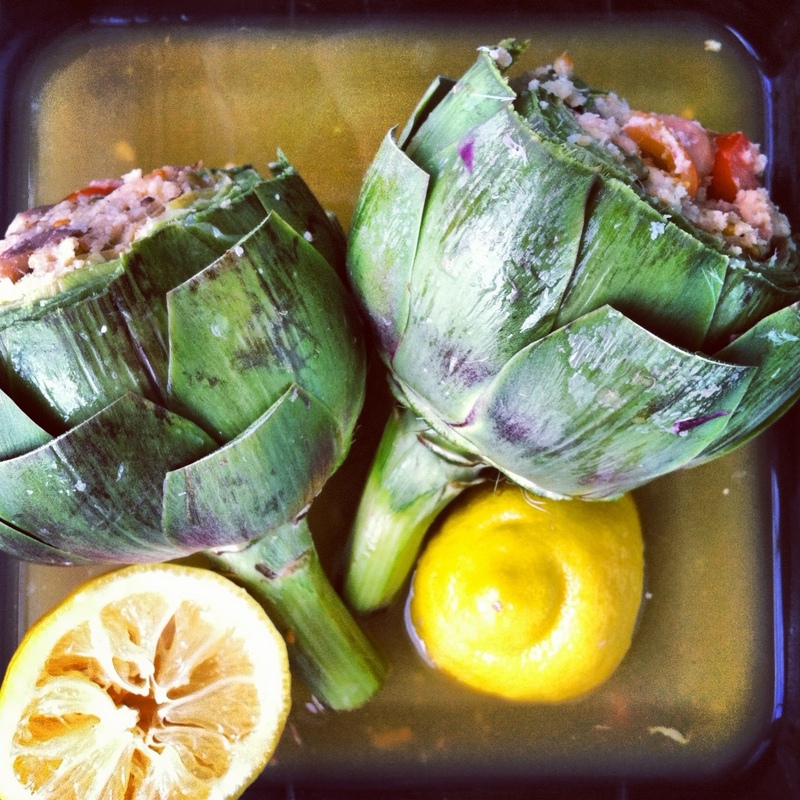 Artichokes: bake for 50 minutes in a baking dish covered tightly with aluminum foil. Pour a 1/4 cup of veggie stock or water into the pan to prevent burning. Check by poking with a fork at the base of the artichoke. The fork should easily pierce the heart with no resistance. The artichoke will also be very soft to the touch when ready. Broil for 5 minutes uncovered once the artichoke is ready. 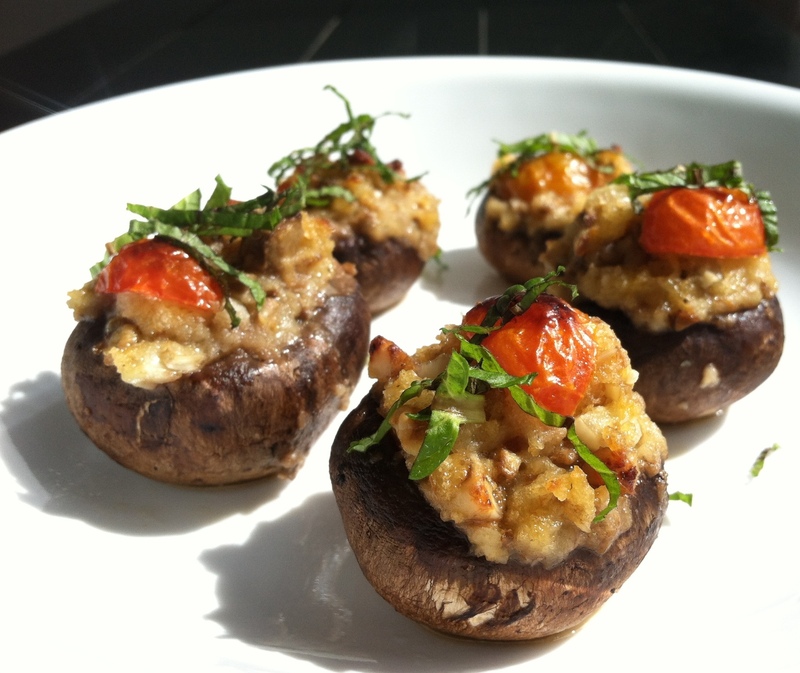 Mushrooms: place mushrooms in a baking dish with a 1/4 cup of veggie stock or water, or enough liquid to reach 1/4 inch. This adds some moisture to the dish to prevent the mushrooms getting dried out or burned. Cover tightly with aluminum foil. Cook for 30-40 minutes (depending on the size of your mushrooms) and check for doneness. Use care when lifting the aluminum foil, very hot steam will be waiting to escape! Mushrooms will be browned and will cook down in size considerably when ready. Broil for 5 minutes uncovered when done. These taste great with a squeeze of fresh lemon and a sprinkle of fresh chopped parsley. Lol I know, it’s true! I do.